If you live in North Central Alabama, hopefully, part of your holiday tradition includes a trip to the Alabama Theatre. Each year for about ten days in December this historic theatre screens holiday classics such as “It’s A Wonderful Life”, “White Christmas” and “Miracle on 34th Street”. 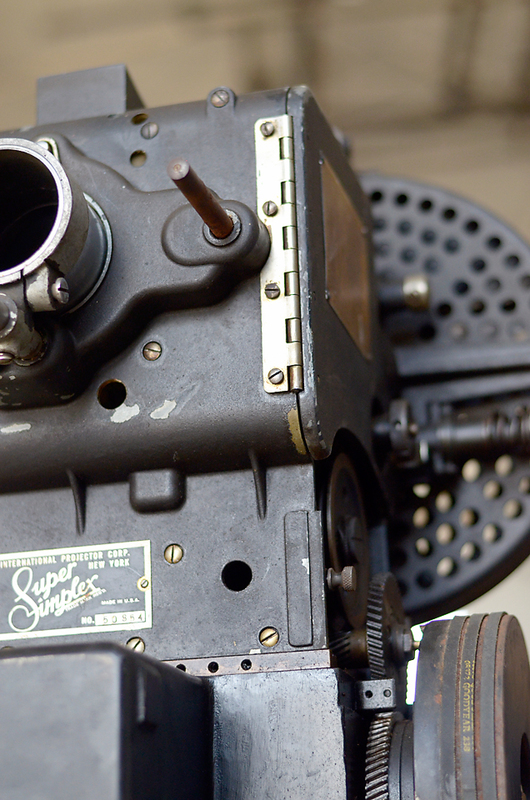 A few months ago, we were fortunate enough to acquire one of the historic film projectors and some old reels that originally belonged to this majestic theatre. While the business of Southern Accents is all about architectural salvage, we also love restoration stories and this is a good one! This historical building almost became a parking lot in the late 1980’s. 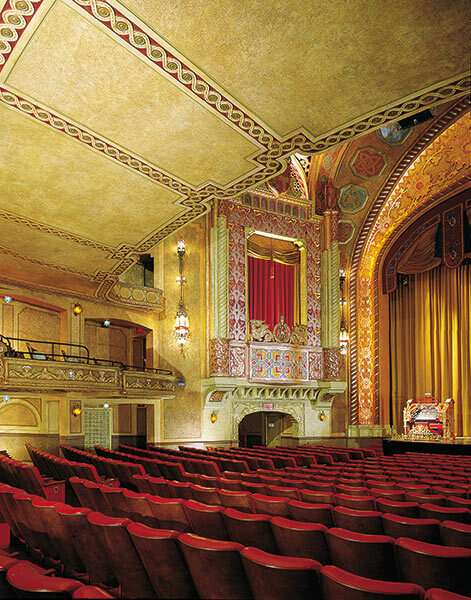 The Alabama Theatre was built in 1927. It is the only remaining theatre of it’s size in the state of Alabama from that era. The theatre was the very first public building in the state to be air conditioned. Seating 2,500 it was known in it’s early days for hosting the biggest Mickey Mouse Club in the world! It was originally constructed to show silent films and is the home to an ornate Mighty Wurlitzer organ, one of only 25 organs of it’s type to ever be built. It was because of this rare organ that the majestic theatre was saved from destruction. In 1987 a non-profit organization, Birmingham Landmarks, Inc, was formed to purchase the building in an effort to save the Mighty Wurlitzer. In 1998, The Alabama underwent a complete restoration. Soon after, the resurrected theatre once again opened it’s doors for operation. In addition to screening beloved classics during the holiday season, the Alabama hosts a variety of events and theatrical productions throughout the year. The building is currently on the National Register of Historical places and in 1993 received the designation of Official Historic Theatre of Alabama. Located less than an hour south of Southern Accents, planning a trip to this historic landmark is well worth the effort. This building is on our list of “must see” places in the state of Alabama! To read more about it’s history and view the schedule of upcoming events, visit the Alabama Theatre online. In 2002, Southern Living editor Morgan Murphy, wrote about Southern Accents in the September issue. In reference to architectural salvage stores he referred to us as the “benchmark store to which I compare all others.” We’ve considered Morgan a friend since his very first visit to our showroom. 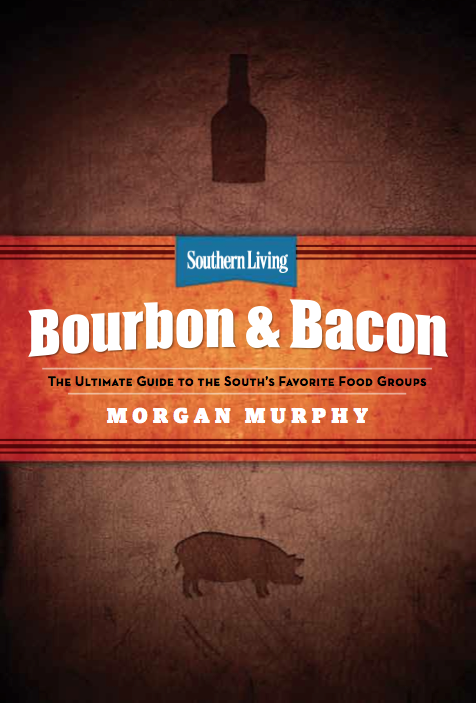 We were thrilled when we recently received Morgan’s new book Bourbon & Bacon – The Ultimate Guide To The South’s Favorite Food Groups. Part reference guide, part recipe book, if you are not a connoisseur of bourbon or bacon, you will be after perusing the pages of this new book. The recipes are mouthwatering, each beautifully photographed in true Southern Living style. Reading the bourbon and bacon guides is simply fascinating and leaves you with a new appreciation for these culinary delights. We are working to schedule a book signing with Morgan at Southern Accents. In the mean time, if you are looking for a Christmas gift for someone who appreciates the artistry of a good bourbon or who is a fan of bacon (and aren’t we all), this book would be the perfect gift! We are always fascinated by the many stories we are able to uncover about some of the architectural pieces that we salvage. One story involves our good friends at Billy Reid and a set of antique doors salvaged from a building in New York City. Southern Accents often travels north in search of salvaged architectural antiques. One such trip saw us return with an incredible set of tall exterior doors. This particular set of doors was simply gorgeous with lots of detailed carving and loads of character. The doors were so striking that Southern Accents owner, Garlan, decided to keep the doors and place them in his home. The doors were temporarily moved to a storage area of our warehouse until they could be retrofitted for his loft. A few months later Billy Reid visited the SA showroom looking for items for their new retail shop in Nashville, Tennessee. Billy spied the New York doors and decided that he had to have them for his Nashville location. After a bit of negotiating, Garlan reluctantly agreed to relinquish the doors to his friend. The magnificent set of doors currently grace the entrance of the Billy Reid store in Nashville, Tennessee, along with a number of other items acquired from Southern Accents. Fast forward one year later… Billy Reid is preparing to open his retail store in New York City on 54 Bond Street. Billy selected a variety of material from Southern Accents for his new location that needed to be delivered. Garlan had a trip to New York already scheduled so he decided to drive up and deliver Billy’s materials himself. Upon arriving in New York, as Garlan began unloading the items, he noticed something that looked strangely familiar. 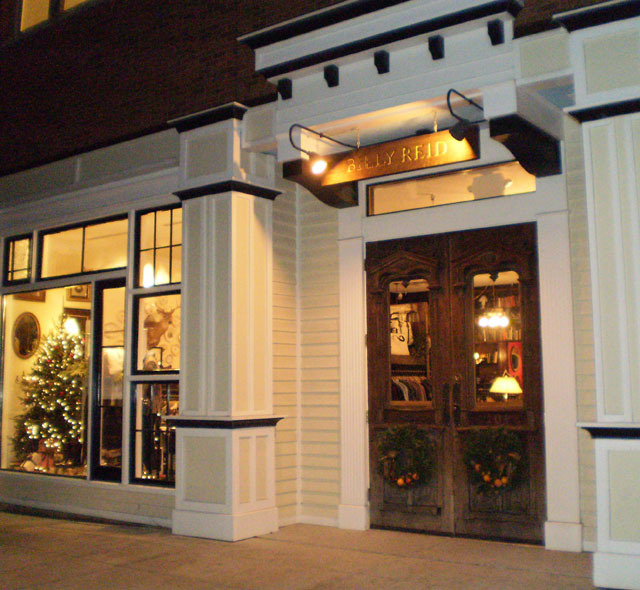 The front doors of Billy Reid’s New York store looked identical to the front entrance doors of his Nashville location. Garlan snapped a few pictures and took a few measurements, confirming that the doors were indeed identical. 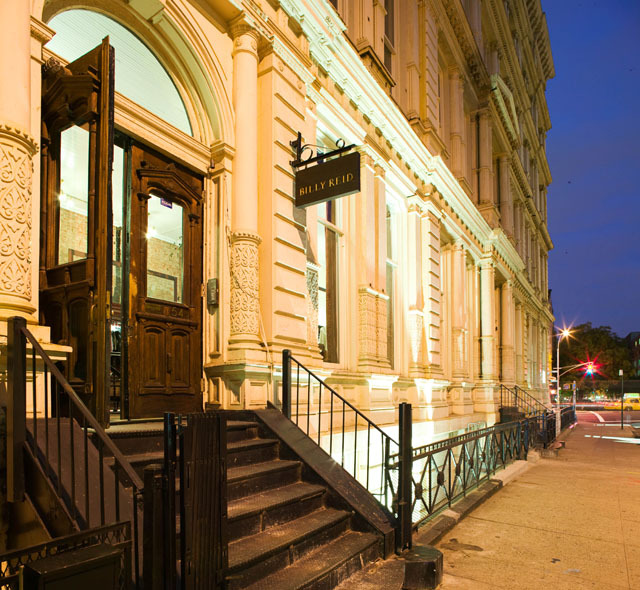 After a bit of investigation, Garlan discovered that the doors he had fallen in love with and purchased almost two years earlier had indeed been salvaged from that very building in New York City! Garlan was thrilled with this discovery as it confirmed that the doors ended up exactly where they were supposed to be. Billy had unknowingly selected entrance doors for his Nashville store that were the original doors that hung on the front entrance of the exact building that would become the location of his New York City store. Coincidence? Perhaps, but this story and others like it are what inspires us to continue doing what we do… rescue, restore, protect and document architectural elements of historical significance. Next time you are in Nashville or New York City, make sure you pay a visit to Billy Reid and pause for a moment before entering the shop to admire the doors! Southern Makers Wins In New York! Last week Southern Accents traveled to New York to attend the prestigious BizBash Event Style Award Ceremony. BizBash is a resource hub for the event industry. Founded in 2008, BizBash is the go to place for professional event planners. Each year they accept nominations and host an award ceremony where the very best in the event industry is recognized. This year, Southern Makers was nominated for a national award in two categories. First, SM was nominated, along with nearly 1,000 other event submissions, for Best Event Decor – Budget Under $250,000. Southern Makers was one of the top three finalists along with the Godiva Lounge at Warner Brothers and In StyleGolden Globes Party and U.S. Travel Association’s IPW (International Pow Wow) Closing-Night Party. The second nomination for Southern Makers came in the category of the People’s Choice Award for Event Decor – Budget Under $250,000. SM was one of the five highest scoring submissions which put us in the running for this award. Southern Accents is a curator for Southern Makers and primarily responsible for the set design and construction of all of the staging and event decor. Receiving such a prestigious recognition from the event industry for Southern Makers was beyond exciting! Although, we did not walk away as the top place winner, being placed in the top five among so many worthy nominations was quite the honor. Garlan and Southern Makers founder Andrea Jean, on behalf of all the SM curators which include Southern Accents, Goodwyn Mills Cawood, Matter, and Eat South, traveled to New York to attend the award ceremony, which was held at the Jacob K. Javits Convention Center in New York City. The creative wheels are already turning as we begin thinking about next year’s two day Southern Makers event scheduled for May 2 – 3 in Montgomery, Alabama. Having a few creatives on the SA team who are a little competitive certainly helps to keep the event decor unique and exciting each year! 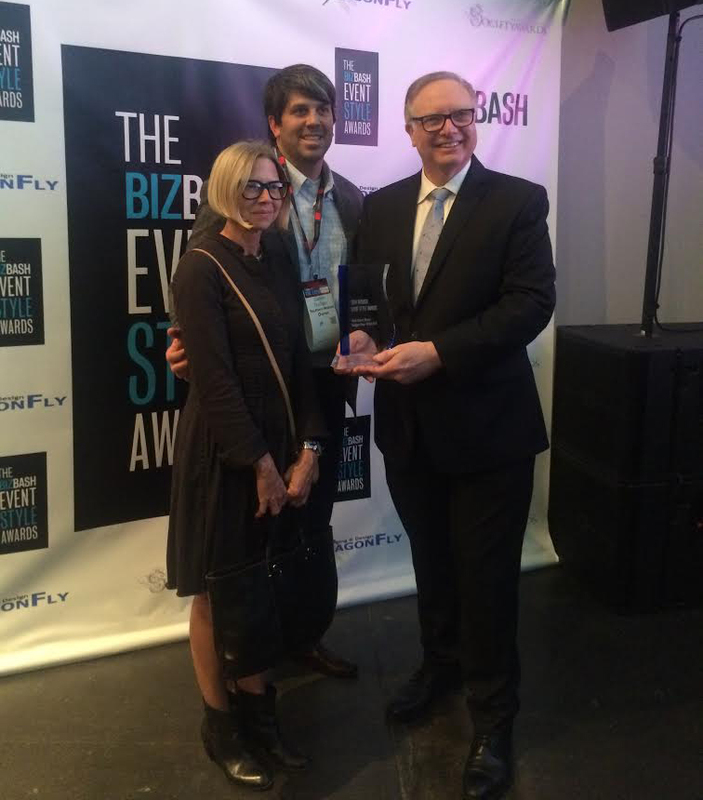 Winning the top place at the BizBash award ceremony is definitely on our bucket list! Garlan Gudger with Southern Makers Founder Andrea Jean and BizBash Founder and CEO David Adler. The deadline for submitting an application for the 2015 event is quickly approaching. If you are an artist, chef, brewer, craftsman, musician, farmer, or designer from the state of Alabama and want to be considered for Southern Makers 2015, you can apply online at: southernmakers.com/application. Submitted applications will go before a curating committee for consideration. Applications must be submitted by November 15, 2014. There are a limited number of spots available. The overwhelming feed back received from this years event was that one day was just not long enough so, Southern Makers is expanding in 2015 into a 2-Day event! Next year Southern Makers will take place on a Saturday and Sunday, May 2 – 3, at the Union Station Train Shed in Downtown Montgomery, Alabama. Mark your calendar now and if you are an Alabama Maker, don’t delay… get your application in today!! Autumn is our favorite time of the year! This past week the leaves on the trees began to “pop” and there is a cool, crisp breeze in the air. Although we think any time of the year is a great time to visit Cullman, Alabama, this time of the year seems especially magical! No matter what direction you are traveling from to get here… the drive is simply spectacular. While we think a day trip to Southern Accents is well worth the trip to Cullman, there are numerous antique shops in Cullman worth visiting. Many of our customers who have made the trip tell us that one day is not enough time to take it all in! Several months ago we put together a brochure listing the trail of antique shops in Cullman. There are twelve shops within a 15 mile radius of downtown Cullman. Although the bulk of our inventory is antique and salvaged architectural items like doors, mantels, claw foot tubs, ironwork, chandeliers, newel posts, hardware and salvaged wood, you will find a huge variety of unique small items, artwork and gifts offered by the multiple antique stores. Whether you are looking for a particular item or are just “junking”, Cullman should be a stopping point on your map! Before you leave our showroom, pick up one of the free brochures. The trail of antique shops begins just one block from Southern Accents. While you are in the downtown area you will want to stop in and enjoy lunch at one of the unique downtown eateries that we have listed on the back of the brochure. We love our town and the people who call it home. Our hope is that you will come for a visit, find it as charming as we do and will want to return often! Most of the small downtown shops, including Southern Accents, are closed Sunday and Monday. Most downtown shops close at 5:00pm during the week and many close early on Saturday so please check the days and hours of operation of the various places you plan to visit ahead of time. Cullman has a wide variety of festivals throughout the year. Check the events calendar on the Cullman Chamber of Commerce website for a list of upcoming events.